When delivering the Child protection training to new employees, I try give staff examples of what has happened at the school and this includes GROOMING. They are often surprised as they seem to think that students won’t get ” dupped” into doing anything stupid or have parents who will monitor everything the child does. Firstly, any child is vulnerable and secondly how can parents be observing the child 24 / 7 and do we really want that? 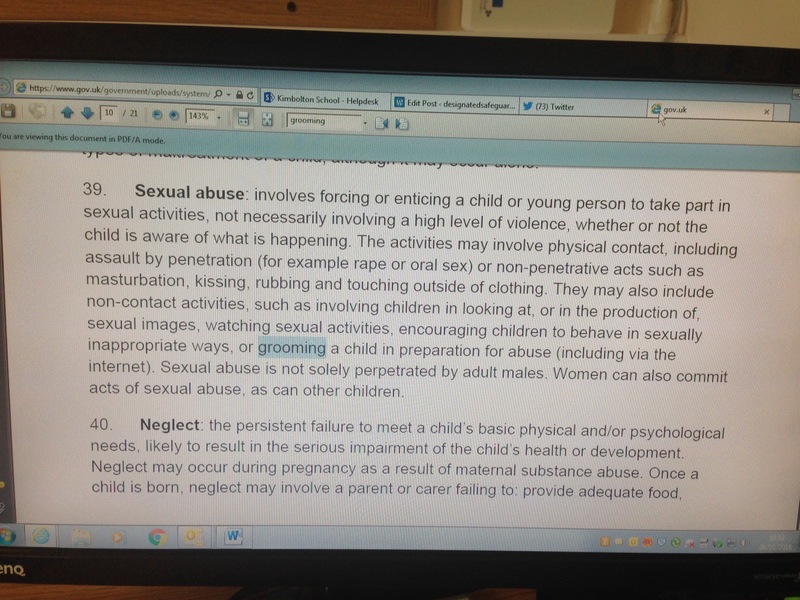 That is almost a safeguarding issue in itself, but anyway I wanted to share two examples. Child A, 17, average intelligence, loving family, very close relationship with twin brother. However she was very insecure about her looks. She would wear a lot of makeup and invest in things to alter her appearance, hair extensions, chicken fillets, nails, eyelashes etc. Not that I am criticising this, we all do things to make us feel better but Child A was obsessive, often spending an hr on her hair in the morning. She started coming to my attention when other boarders expressed concern about her boyfriend. They showed me his Facebook page, which had no photos of his face. Any photo he had, was of his torso or from behind. None of her friends knew him and Child A had admitted to her friends that she hadn’t met him, yet their Facebook status said that they were in a relationship. After speaking to Child A, it was apparent that she ” loved him”. She said she had spoken to him over Skype and that he made her feel good. Looking at her messages all on different medias, she seemed to speak to him all the time. He was always positive and boosted her moral. I was dreading seeing a request for images, but couldn’t see any. I asked if Mum and Dad were aware and Child A said no although it was her 18th birthday soon and he was going to take her out somewhere. The more I asked, the more confusing this birthday celebration seemed. Finally she told me that he has booked a posh hotel and would meet her there and that she wasn’t going to tell parents. She got angry with me, when I said I would be telling, claiming I was breaking up the ” one good thing she had”. Parents were not surprised when I told them. I think they had suspected something and the twin brother had picked up on a few things. They prevented her from going and contacted the police. They didn’t get any feedback but the boys Facebook profile suddenly vanished as did all the other media accounts he had set up with her. Child A was very angry for several months and blamed us for everything. She refused any counselling. Child B, aged 17, Oxbridge candidate, loving family although no siblings and parents work long hours. Child B came to my attention when I received a phone call from the police informing me that they had just interviewed her with her mother about damage to their property. During the interview several safeguarding concerns came up. Child B had been in a relationship with a boy for 14 months via social media. She had shared naked pictures of herself with him and had received pictures. Only the boy wasn’t a boy, he was in fact Child B best friend, a girl who was their neighbour, who had been ” pretending to be her boyfriend for a laugh”, although she later admitted that she liked to have power over Child B. Recently the mother was getting suspicious about the relationship and was pushing Child B for an introduction. The boy kept flaking out of all the invites, so in the end called the police. Child B told her ” best friend” who freaked out and for some reason started to damage Child B property, graffiti etc. Luckily the police could step in at this point. Child B spent a lot of time in counselling trying to come to terms with the fact that she had been deceived not only by a boy she liked but her best friend. So my point is, anyone could be groomed. And it isn’t just paedophiles who do the grooming. Its far more complicated than that. There are so many repercussions to the child that we have to be alert as teachers, listen and watch out for the signs in our training. But most of all be willing act.